UNITED NATIONS (AP) — North Korea sent items used in ballistic missile and chemical weapons programs to Syria along with missile technicians in violation of U.N. sanctions — and banned ballistic missiles systems to Myanmar, U.N. experts said. The panel of experts monitoring sanctions against North Korea said its investigations into Pyongyang's transfer of prohibited ballistic missile, conventional arms and dual use goods found more than 40 previously unreported shipments to Syria between 2012 and 2017. It said an unnamed U.N. member state also reported evidence of Myanmar's receipt of a range of conventional weapons from North Korea including multiple rocket launchers and surface-to-air missiles in addition to ballistic missile systems. The Associated Press reported on Feb. 2 that according to the experts' report, North Korea was flouting U.N. sanctions on oil and gas, engaging in prohibited ballistic missile cooperation with Syria and Myanmar, and illegally exporting commodities that brought in nearly $200 million in just nine months last year. AP obtained details from the more than 200-page report late Tuesday, including the panel's findings related to chemical weapons in Syria. 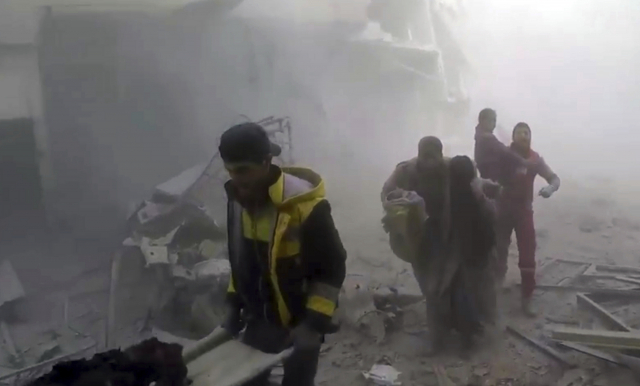 The U.S. and other Western nations have accused Syria of using chemical weapons against rebel-controlled areas including recently in the Damascus suburb of eastern Ghouta, which President Bashar Assad's government denies. The report to the U.N. Security Council, which diplomats expect to be made public in mid-March, details "substantial new evidence" about North Korea's dealings with Syria, dating back to 2008. According to an unidentified member state, the North's Ryonhap-2 Corporation was involved that year in a Syrian ballistic missile program, the "maneuverable re-entry vehicle (MARV) Scud D (MD) project," the report said. More recently, it said the August 2016 visit by a technical delegation from the Democratic People's Republic of Korea — the country's official name — "involved the transfer to Syria of special resistance valves and thermometers known for use in chemical weapons programs." That information came from another member state which also reported that North Korean technicians "continue to operate at chemical weapons and missile facilities at Barzeh, Adra and Hama," the report said. It quoted Syria's reply to the panel about the reports: "There are no DPRK technical companies in Syria and the only presence of some DPRK individuals are confined in the field of sports under private individual contracts for training athletics and gymnastics." The experts added that they have not yet received a reply for documents supporting this claim and a list of all North Koreans who have traveled to Syria. The panel said it also examined shipments interdicted by member states that were sent by the Chinese company Cheng Tong Trading Co. Ltd. to Damascus-based companies in 2016 and 2017. The experts said 13 shipping containers were filled with "acid resistant tiles" which would cover 5,000 square meters, enough for a large-scale industrial project. One country's analysis concluded that the tiles "were to be used for activities conducted at high temperatures," the panel said, while another country said the material "can be used to build bricks for the interior walls of (a) chemical factory." The panel also said it continued its investigations into activities of Ryu Jin, a senior official in Syria for the Korea Mining Development Trading Corporation known as KOMID, who is on the U.N. sanctions blacklist. He listed his rank as a major general in a letter with an official proposal to Syrian Major General Ali Salim of the Army Supply Bureau for "an air defense command and control system," it said. KOMID is the DPRK's primary arms dealer and main exporter of goods and equipment related to ballistic missiles and conventional weapons. The report said among other activities Ryu Jin shipped ball-bearings and fiber-optic cables to Syria and earned 56,000 Euros and 48,000 Euros respectively, which was transferred through Tanchon Commercial Bank. The panel said its investigations into several cases of previously unreported arms shipments and cooperation with front companies for those under U.N. sanctions between 2010 and 2017 "showed further evidence of arms embargo and other violations, including through the transfer of items with utility in ballistic missile and chemical weapons programs." For many years, the panel said the DPRK Corst Company acted on behalf of the Second Economic Committee, which is under sanctions, to ship goods to Syria for use in prohibited programs. The panel said it received documents in July 2017 showing Corst shipped banned goods to a researcher at Syria's Scientific Studies Research Council, which the U.S. says is the government agency responsible for developing and producing non-conventional weapons and the means to deliver them. As for Myanmar, the panel said an unnamed member state reported that its Directorate of Defense Industries "maintains a sophisticated global procurement network" and "is seeking equipment from overseas suppliers for its DPRK-linked missile program." The panel said it previously concluded that Myanmar's So Min Htike Co. Ltd, "was the consignee in the attempted transfer of prohibited nuclear-related items in 2012." While Myanmar told the panel in 2015 that it only had "normal diplomatic ties" with the DPRK, it reported on July 26, 2017 that it expelled Kim Chol Nam, a DPRK diplomat "for acting on behalf or at the direction of KOMID." And on Jan. 24, 2018, the panel said "Myanmar added that it was investigating the panel's latest request for information."